The presence of the Fig Tree and the Umbrella Pine tell us that we are in the warm climes of the Mediterranean. In the shaded foreground among poppies, irises and other flowers, a man has cast his spade to the ground and reaches up to pick a fig while another, sitting beneath the tree, reads a book (Signac used his gardener as a model for both figures). A reclining woman (the artist’s wife) plays with a child; two men play boules. In the middle-ground others are engaged in various activities on the sun-drenched headland. Down by the water’s edge a painter captures the likeness of his muse while, in a central position, two lovers embrace and contemplate a small posy of picked flowers; women hang out washing and a sower casts his seed. Further back there is dancing beneath the pine while labour saving, steam driven, agricultural machinery helps with the hard work. Out in the bay a three masted sailing ship under full sail makes for harbour. In 1891 Signac’s great friend Henri Edmond Cross, plagued by chronic rheumatic pain, had moved to the Saint-Tropez area. The next year Paul Signac first arrived in Saint-Tropez and started to think of painting a large scale pictorial idyll set in the south. In an exchange of correspondence between the two friends in 1893 Cross wrote ‘ Your idea of a large canvas is perfect. Until now, the pictures dealing with anarchy always depicted revolt either directly of indirectly, through scenes of poignant misery. Let us imagine instead the dreamed-of age of happiness and well-being and let us show the actions of men, their play and their work in the era of general harmony’. 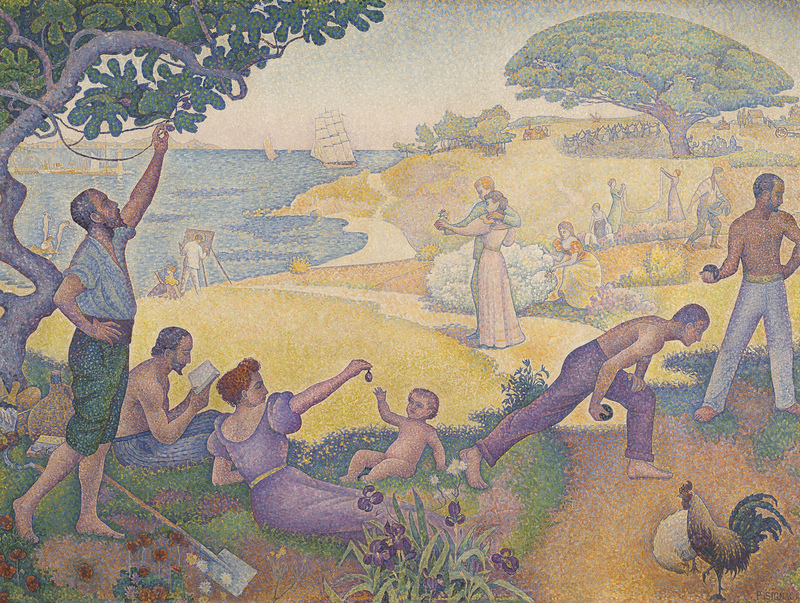 This is Signac’s response to his friend’s entreaty – a bucolic Arcadia set in the ‘sweet country’ of the French Mediterranean coast, only recently dubbed (1887) the Cote d’Azure. Signac, Cross and later artists contributed to the coast’s allure. In many respects the painting owed a debt to the very influential Pierre Puvis de Chavannes who specialised in large scale murals set in classical glades or in the gentle breezes of a summer coast. Signac spent hours contemplating Puvis’ work in the Sorbonne and in Lyon. In Puvis’ Doux Pays, a large scale mural painted in 1882, a group of somewhat listless women stand or sit on a raised area overlooking a placid sea, immersed in there own thoughts. One of the women stands to the extreme left of the composition, hand upraised, holding the trunk of a fig tree – Signac has placed his tree in exactly the same position, replacing the older artist’s woman with a man reaching for a fig. But more importantly Signac has drawn on Puvis’ ability to create an atmosphere of timeless serenity. In 1897 Signac offered the painting to the Maison du Peuple in Brussels, then being built to the designs of Victor Horta, the renowned exponent of Art Nouveau architecture. It seems that Horta was unenthusiastic at this prospect and after much temporising and evasion, Signac lost patience and the offer was withdrawn in late 1900.